Any good study begins with a definition of the subject area. While this course is designed to describe in detail what error-variety coins are and give the basics of how they occur, let’s begin with a simple description. An error-variety coin is one which has a variation of any kind from the normal as a result of the minting process. This process includes the making of planchets, the making of dies, and the striking of coins. Almost immediately you begin to see the immensity of the task before us. But before we jump in, let’s jump back and survey the history of error-variety collecting. Before the 1950s, the average coin collector looked for type coins in specific dates and grades to complete a set. Although there was much for the collector to choose from in U.S. and foreign coinage, unique or unusual items were collected by only a few. Error-Variety (EV) collectors were as scarce in those days as the oddities they collected, but in spite of this, some of today’s well-known EV collectors really were getting started back then. Delma K. Romines began collecting variety coins when he was a young boy and found his first over mintmark in the late 1940s. Bill Fivaz started collecting as a teenager in 1950, although he wasn’t hooked on varieties until much later. These men are at the forefront of variety collecting today and have in many ways shaped the EV hobby. The hobby has grown over the past few decades to see the formation and combination of EV-collecting clubs as well as the publication of books and magazines by knowledgeable EV experts. Today, collectors and dealers around the world attest to the value of minting varieties and participate in one form or another in this segment of the numismatic community. This section gives you a brief history of the events that have made the EV hobby what it is today. By the 1950s, enough EV collectors knew about each other that they decided to form a club. The Collectors of Mint Errors club was born in 1956 and became known in the numismatic community as COME. The group was led by Michael Kolman, Jr. and Raymond Larson. COME subsidized a monthly magazine known as the Mint Error Collector Bulletin. COME was the patriarch of EV coin clubs in the U.S. It established much about the way we approach EV collecting today. COME encouraged its members to participate in local coin shows and to competitively exhibit their minting varieties. The club began to grow and members began to win first, second, and third-place awards at local coin shows. Between the Bulletin, members’ auction catalogs, coin show participation, and coin exhibition, COME provided the basic structure that makes up today’s EV clubs. Current clubs may offer more or less programs, but it is all built on the foundation laid by the members of COME in the 1950s. EV collecting gained popularity in the 1960s on the momentum of the new memorial Lincoln cents, first minted in 1959, and the 1960 small and large date cents. 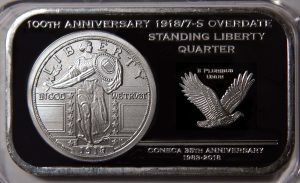 By this time, the activity of COME had generated enough EV press that the numismatic public started paying attention to new discoveries such as these. Minting varieties were known as FIDOs, for freaks, imperfections, defects, and oddities. Most were inexpensive and widely available. As collectors gained more knowledge on the types of minting varieties that existed, they began to rank them in importance to the hobby. Some felt the major errors or striking errors were most important to the hobby, while others felt the minor errors or die varieties were most important. Consequently, COME ceased to exist in 1960 and its club members later settled into two opposing camps. Some members of the dissolved COME came together again in 1963 to form the Collectors of Numismatic Errors, known as CONE. Based in Deadwood, South Dakota, this club focused mostly on die varieties such as doubled dies, repunched mintmarks, major die breaks, die cracks, and die chips. The club was lead by Al Maynard, Harry Parshall, and Jack Sams. Later, Alan Herbert (deceased), John Wexler, and Robert Wilharm became key figures in CONE. The official club publication was the Errorgram. This was a monthly publication that later became a weekly page in a small county newspaper known as the Dresden Post Transcript. The Errorgram was printed in that form until August 1981. About the time CONE was formed, many of the collectors who were interested in major minting errors combined to form the Numismatic Error Collectors of America. Known as NECA, this club was based in Studio City, California. The club was started by Mort Goodman, Arnold Margolis, Jim Johnson, and several others who were interested in striking errors. NECA’s official publication was the Errorscope, which was printed for many years by Lonesome John Devine. Though the philosophical differences between the two national clubs led to tension at times, it also encouraged EV collectors to expand geographically. During the 1960s, local EV clubs were formed in Alabama, California, Colorado, Indiana, Massachusetts, New York, Texas, Wisconsin, and Toronto, Ontario, Canada. Today’s most popular annual EV collecting event, the Errorama, actually began with a local EV club in California. The first Errorama was an EV coin show held in Hollywood, California, in 1967. Other Erroramas followed in southern California during the next five years, each sponsored by a local EV coin club and each providing a forum for collectors to exhibit their coins and collectively discuss and learn about EV coins. The 1970s brought even more publications for EV collectors. CONE and NECA continued to function independently and publish the Errorgram and the Errorscope, while other dedicated EV collectors were putting out books like Modern Mint Mistakes and magazines like Error-Variety News. Dealers such as Fred Weinberg and Lonesome John began printing catalogues that supplied mostly planchet and striking error coins; these were readily received by EV collectors as they provided not only a new source for purchasing EV coins, but a reference aid for their own coin research. Perhaps the most significant accomplishment in the EV hobby in the 1970s was the creation of the Planchet – Die – Striking (PDS) system by Alan Herbert (deceased) in 1971. This system provided a method for defining, listing, and pricing minting varieties. When published in Coin Prices magazine by Krause Publications, the system was immediately received by collectors and dealers as well. The PDS system replaced the major-minor classifications used by collectors in the 1960s and laid the groundwork for renewed communication between collectors of planchet and striking errors, and collectors of die varieties. During the 1970s, collectors relied on publications, local club meetings, and coin shows to feed their enthusiasm for the hobby. The Erroramas had gone by the wayside after the 1972 show in San Diego. But as CONE and NECA members began to find a common ground in the PDS system, they gradually set their differences aside. Beginning in 1980, Lonesome John revived the Errorama, and in 1982, both CONE and NECA participated. Since many collectors were in both clubs and members were becoming less willing to take leadership roles, the clubs voted in 1983 to combine, forming CONECA – the Combined Organizations of Numismatic Error Collectors of America. The newly formed club functioned for a brief time under the umbrella of The Error Coin Museum, which was primarily a legal entity established to allow the former clubs to dissolve without incurring major tax penalties. 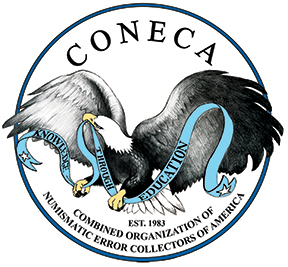 CONECA eventually separated from The Error Coin Museum and became a totally independent numismatic organization. CONECA combined CONE’s Errorgram and NECA’s Errorscope to produce the Errorscope/gram and later renamed it the Errorscope. The new organization generated new and fresh ideas that are evident in the Errorscope issues printed throughout the 1980s. And as a combined organization, CONECA began to offer programs that appealed to all types of members – clubs-within-a-club, authentication services, auctions, youth programs, a materials library, and continued emphasis on annual Erroramas. With the club issues settled, EV collectors sensed a new energy in the hobby. The discovery of the 1983 Lincoln cent doubled die reverse enthused variety collectors and aided in recruiting new collectors. New faces entered the arena and the 1980s saw the publication of such key material as The RPM Book by John A. Wexler and Tom Miller, The Lincoln Cent Doubled Die, and The Encyclopedia of Doubled Dies, Vol. 1 & 2, all by John A. Wexler. The Cherrypickers’ Guide to Rare Die Varieties by J.T. Stanton and Bill Fivaz became the EV collector’s Bible in 1990, but with the many discoveries made by collectors, it was quickly out of date. In 1994, Stanton and Fivaz published a third edition of the book and it is being used just as faithfully as the first two editions. The EV collector of the 1990s has a wealth of such resources readily available. 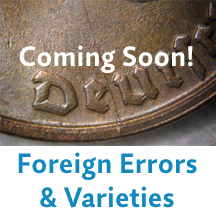 Long-time minting variety expert Alan Herbert (deceased) published the fifth edition of Minting Varieties and Errors in 1991, and Arnold Margolis of Error Trends Coin Magazine published The Error Coin Encyclopedia in 1991 as well. EV collectors use these two works faithfully to answer definitive questions about their finds. CONECA has pursued a closer affiliation with the ANA in the 1990s by sponsoring Erroramas in conjunction with the ANA annual summer convention. These events have grown to encompass club round-table meetings and numismatic theaters, as well as the CONECA banquet and the annual club business meeting. The discovery of the 1995 Lincoln cent doubled die sparked the public’s interest again and generated publicity for both the hobby in general and for CONECA. Though collectors have plenty to look for in the vast expanse of known EV coins, they are always eager to know about a major new find, and the 1995 Lincoln was no exception. Those who picked the variety out of their pocket change made a profit, and those who paid a premium price for it were somewhat disappointed as more people found the coin and its initial high price began to drop. EV collectors love to share the enthusiasm of a popular find like the ‘95 Lincoln cent doubled die. But the true EV collector is equally satisfied with a relatively unknown variety cherrypicked in a high grade. That enthusiasm is what has kept EV collectors hunting for decades and will keep them doing so for many more.